Research in the theory and applications of statistics as a new scientific discipline began in India in the early twenties through the pioneering initiative and efforts of late Professor P.C. Mahalanobis who has rightly been described as a great visionary. A small group of young scientists was picked up by him for this purpose from the Department of Physics, Presidency College, Calcutta, where he used to teach. This group formed the nucleus of a laboratory which later came to be known as the Statistical Laboratory. In the early thirties, realising the necessity for the advancement of theoretical and applied statistics in India, Professor Mahalanobis together with Professor P.N. Banerjee and Professor N.R. Sen, both of Calcutta University, convened a meeting on December 17, 1931 to consider various steps for setting up an association for the advancement of statistics in the country. It was unanimously resolved to set up the Indian Statistical Institute with Sir R.N. Mookerjee as President and Professor P.C. Mahalanobis as Honorary Secretary. The Indian Statistical Institute (ISI) was registered as a non-government and non-profit society of learned men on April 28, 1932. 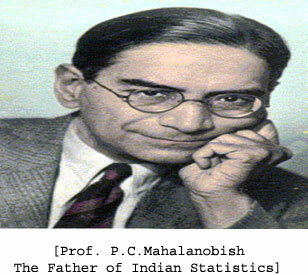 From a modest beginning, the Institute grew under the able leadership of Professor Mahalanobis into an all-India . organisation which is now functioning under the aegis of the Department of Statistics, Ministry of Planning & Programme Implementation, Government of India The Department of Statistics of Calcutta University, on the other hand, is the oldest among its counterparts in this country and is one of the pioneering Statistics teaching departments in the world. It was created in 1941 in co-operation with Indian Statistical Institute and Presidency College, Calcutta, with professor P.C. Mahalanobis as the Honourary Head. This opened up, for the first time in India, facilities for the full-fledged training on the theory and application of statistics. Beginning its journey in July 1941, at Presidency College, the Department shifted to Ashutosh Building of the College Street Campus of the University in 1945 and subsequently to its present location in the Ballygunge Science College Campus in 1964. From a modest beginning, the Department has over the last six decades had a phenomenal expansion. It has continuously produced illustrious students who have occupied important and prestigious positions in institutions and organizations across the world. In the initial years the Department of Statistics of Calcutta University and the Indian Statistical Institute worked together for dissemination of the knowledge in Statistics throughout India. Now Statistics as a discipline of study is very popular both in India and abroad.